On a Windows 7 computer, with Office 2013 installed, suddenly all DOCX files were not displayed with the default Word icon in Explorer, even though the DOCX file association was set up correctly and all docx files opened without problems with Word 2013 application. How to fix: DOCX files are displayed with a generic icon in Windows Explorer. Step 1. Scan your computer for viruses. Viruses or malicious programs can cause your PC to work abnormally. So, before you continue to troubleshoot your problems, use this Malware Scan and Removal Guide to check and remove viruses or/and malicious programs that may be running on your computer. Step 2. Temporally set DOCX files to open with WordPad and then revert back to Word. 2. At "How do you want to open this file" options, click More apps. 3. Scroll down and select WordPad and then check the "Always use this app to open .docx files" checkbox. Click OK when done. 6. 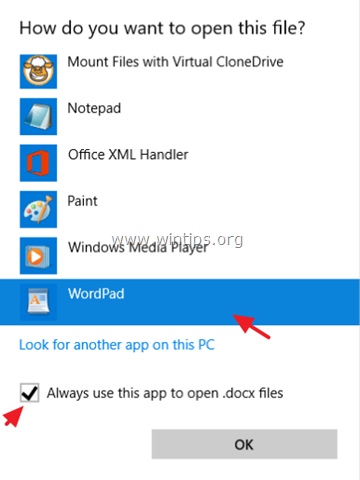 Select the Word program from the list and then check the "Always use this app to open .docx files". 8. 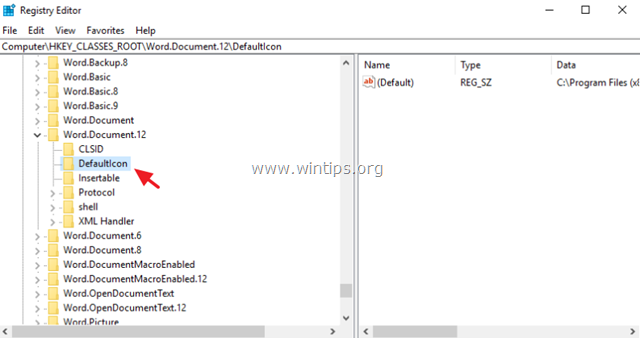 Close Word application and then check if the DOCX files displayed with the right Word icon in Explorer. If the problem persists continue to the next step. Step 3. Set DOCX files to open with "winword.exe" application. 3. First, scroll down and check the "Always use this app to open .docx files" checkbox. 4. Then click above at Look for another app to open .docx files option. 8. Close Word application and then check if the DOCX files are displayed with the Word icon in Explorer. If the issue persists, then continue to the next step. Step 4. Modify Default Word icon in Registry. 5. 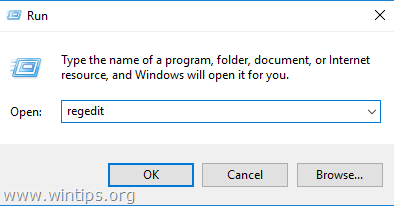 Close Registry Editor and restart your computer. 6. If after restart, the Word icon is not displayed in docx files, then the final step is to repair your Office installation. That it! Let me know if this guide has helped you by leaving your comment about your experience. Please like and share this guide to help others. « How to Disable Automatic Update in Adobe Reader DC	» How to Automatically Backup Outlook 2016, 2013 or 2010 PST Data File. Great tutorial! Unfortunately, none of the 4 steps fixed my problem. So my last resort is to repair the Office installation. But before I do, I wonder if this fix will affect the Quick Access Toolbars I modified in word, excel and ppt. I put a lot of effort into personalising those toolbars and I rather not do it again, just to fix the icon-problem. Do you know if they will be deleted after the fix and/or do you know if those personalised toolbars can be backup-up and restored after the fix? Thanks a million! @Fred: I'm not sure, but I think that the personalizations will not be affected.